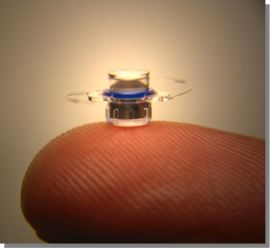 The Implantable Microscope Technology (IMT) is the first-of-a-kind telescope implant created as part of the CentraSight™ treatment program, a new option for treating patients with end-stage macular degeneration – the leading cause of blindness. This disease effects over 1.6 million aging Americans by creating a permanent central vision blind spot, making it difficult or impossible to recognize familiar items as well as family and friends. The symptoms of macular degeneration are a loss of central vision. Some people may find that they are having trouble recognizing people, reading the newspaper, and may feel disoriented at times. Until the availability of the CentraSight™ telescope implant, patients with the most advanced form of AMD had no other options. End-stage AMD is a devastating disease that cannot be treated by any available drugs or surgical procedures. telescope, is smaller than a pea and replaces the eye’s lens, magnifying the central region of vision. The blind spot may decrease due to this treatment and vision may improve. The tiny telescope is implanted in the space of the eye’s natural lens to help improve vision in patients with End-Stage Macular Degeneration. The IMT reduces the impact of the central vision blind spot by projecting the object the patient is looking at onto the healthy area of the retina, not the area degenerated by the disease.